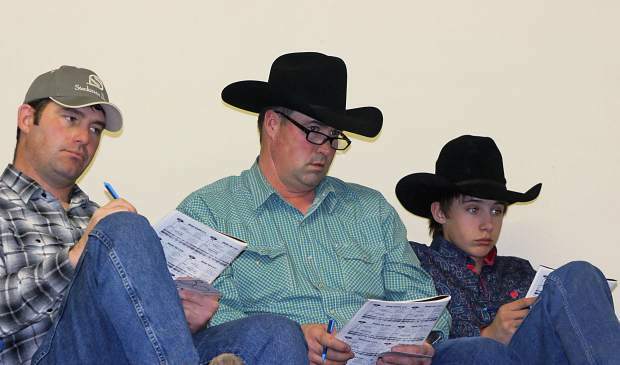 Abe, Tyler and Edward Murnion, Jordan, Mont., purchased Brooks Angus bulls. 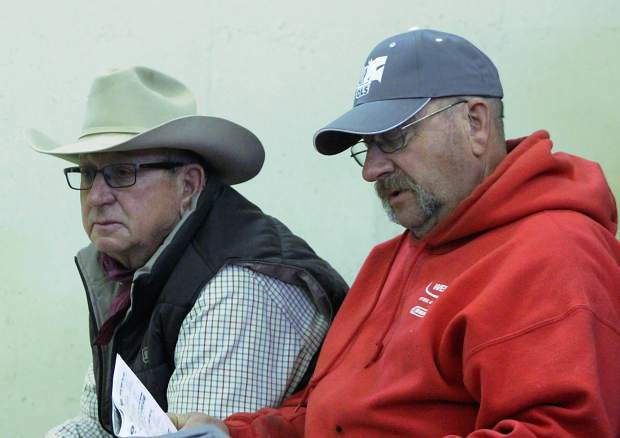 Sale hosts Ryan and Steve Brooks at the Brooks Chalky Butte Angus Ranch production sale. 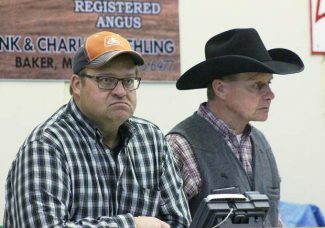 Dan and Collin Christman, Hettinger, N.D., repeat Brooks Angus bull buyers. Brooks Chalky Butte Ranch offered up a great set of top-notch bulls for their annual production sale held at Bowman Auction Market, Bowman, North Dakota, on Apr. 4. Steve and April and Ryan and Becky along with their families welcomed a large crowd of buyers and spectators for the sale. These bulls were moderate framed and thick with a huge number that would be recommended for use on heifers. Over 70 percent of the bulls in the sale offering would be suitable for heifers. There were several large sire groups, allowing buyers the opportunity to purchase half brothers in volume. The commercial heifers in the sale were all sired by Brooks Angus bulls and consigned by loyal repeat Brooks Angus bull buyers. This was as fancy a set of commercial heifers available this spring. You could buy with confidence from a trailer load to several pot loads. The top selling bull on the day was lot 1, Brooks Confidence 413, a Feb. 2014, son of Connealy Confidence 0100. This high performance, calving ease herd sire prospect had a 205 day wt. of 736 pounds to ratio at 120 and 365 day wt. of 1,368 pounds to ratio 118 with an average daily gain ratio of 115. The bull has epds of CED 17 BW -1.7 WW 64 Milk 36 YW 112. Cecil Wilson, Watford City, North Dakota was they buyer at $23,000. Selling at $17,000 was lot 13, Brooks Consensus 4360, a Mar. 2014, son of Connealy Consensus 7229 with epds of CED 4 BW 2.2 WW 66 Milk 33 YW 119. This bull has a weaning ratio of 112, yearling ratio of 120, IMF ratio of 112 and ribeye ratio of 117. 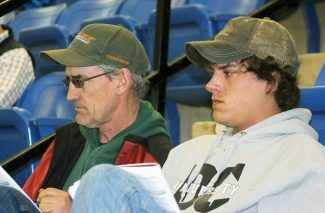 Brian Goven, Mercer, North Dakota, was the buyer. Lot 17, Brooks Consensus 4365, another Mar. 2014 son of Connealy Consensus sold to longtime repeat buyer L Double Bar Ranch, Rhame, North Dakota, for $13,500. This bull has epds of CED 4 BW 1.8 WW 64 Milk 33 YW 109 and had a weaning ratio of 116. L Double Bar Ranch got another Consensus son for $13,000 in lot 15. Brooks Consensus 4277 has epds of CED 4.0 BW 2.4 WW 63 Milk 32 YW 108 with a 205-day ratio of 116-year ling ratio of 113 and ribeye ratio of 116. Lot 10, Brooks Full Power 445, a Feb. 2014, son of PA Full Power 1208 sold to Gartner-Denowh Angus, Sidney, MT for $11,000. This bull has epds of CED 11 BW -.2 WW 64 Milk 43 YW 107. Lot 4, Brooks Confidence 457, a Feb. 2014 son of Connealy Confidence 0100 with epds of CED 13 BW -.4 WW 57 Milk 32 YW 101 sold to Dennis Payer, Wagner, South Dakota, for $10,500.